As a working mom, Lisa Clark is constantly on the clock and trying to find ways to cheat time. There are days where she literally mothers her twin tweens remotely from her phone, making sure they have arrived home safely, that they have changed out of their school clothes, that they are doing their homework or are on their way to horse-riding. And when her day gets busier, the last decision she wants to make is what to cook her family for dinner. 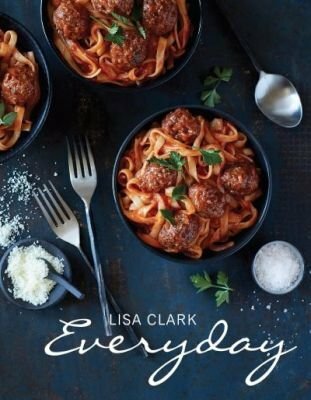 In Everyday shares some insights into how to provide healthy, balanced and quick recipes for the mom (or dad) on the move! The book is divided into 10 chapters, each starting off with a basic recipe and then followed by several others that show how to turn one quick meal into several appetising dishes. From muesli, tomato sauce and roasted vegetables to fish, chicken, pastry and sponge cake, there is sure to be a recipe to inspire your everyday cooking.